Published: June 5, 2012 at 02:37 p.m. Updated: Aug. 4, 2012 at 03:52 a.m. The Electronic Entertainment Expo began on Tuesday. If you'll excuse the hacky analogy, the event is easily the Super Bowl for gamers. Every major gaming company (including EA Sports, the makers of the popular "Madden" football series) will introduce the latest and greatest products for the upcoming year. Before we look into the future, it's important to take a look back at the greatest sports video games of all time. When it comes to a subject as cherished as video games, it's appropriate to go heavy on the honorable mentions. NFL Fever: Produced by Microsoft exclusively for the Xbox console, this game really challenged the folks who make "Madden" to step up their game. As a result, many of the innovations seen in "Madden" were taken from NFL Fever. One on One: Dr. J vs. Larry Bird: You might better remember the sequel, which replaced Dr. J with Michael Jordan. But the original was created for personal computers, a seminal moment that actually made the PC cool. NBA Jam: Not the most realistic game, unless Scott Skiles really can burst into flames while executing a half-court dunk. But hey, games don't all need to be super realistic. Lakers vs. Celtics: The first game to introduce real-life players with recognizable moves, such as Tom Chambers' famous dunk. Need for Speed: Hot Pursuit 2: Wait, this is a racing game in which you assume the role of an outlaw? If only it was possible to drive an ambulance, I could have been Burt Reynolds in "Cannonball Run." NCAA Football: I love the "dynasty" mode of this game; the coaching-carousel feature is the best. I actually prefer this football game to "Madden." Tiger Woods PGA Tour. Replacing a broken controller is much cheaper than replacing a broken putter. Tony Hawk Pro Skater 2: Likewise, I never bruised my coccyx playing this video game the way I did skating a swimming pool in high school. Blades of Steel: Yes, you played for hours, but not to win games so much as to provoke fights. Street Fighter II: What? It's a sport. Mario Kart: I don't mean to spark a debate on whether racing qualifies as a sport, but how many of you would love to shoot off red turtle shells on the freeway? Ok, so the graphics look as antiquated as Zack Morris' cell phone on "Saved by the Bell," but this game was mind-bending when it first arrived in the 1980s. Remember, this was a generation entertained by "Pong;" anything new was widely embraced. This game stood out because it allowed players to create their own tracks. The only downside: said tracks couldn't be saved (and I made some awesome ones). Let's give a quick nod to the King of all sports video games. "Madden" deserves much credit for remaining competitive over the years despite all of its competition being eliminated. The thing I love most about this game: I can move the football team in St. Louis back to Los Angeles, which has become a yearly tradition. Baseball games have advanced so much in recent years. But no baseball game has managed to match the charm of "Baseball Stars." That this managed to become a gem was a rare feat, considering its lack of a license (although playing against the likes of the American Dreams and Lovely Ladies was just as compelling as facing off with the New York Yankees or Boston Red Sox). This was also the first baseball game to keep seasonal statistics. Just remember to push "reset" and "off" at the same time when powering down. When I vacationed as a kid with my parents in San Diego, I spent hours in the arcade pumping quarters into "Punch-Out." When this game was made into a home version, I thought life could never get any better. Well, at least until I lost the first fight to Glass Joe, which might have been my lowest point. The game was often criticized for removing the fighting and the blood (much to the chagrin of gamers who wanted to recreate the classic hockey scene from the movie "Swingers"). The series took a huge step forward with this edition, which added the one-timer and an unmatched level of individuality for the players. Anze Kopitar paid homage to this game when he beat Martin Brodeur for the winning goal in Game 1 of the Stanley Cup finals using my patented NHL '94 move. "Tecmo Super Bowl" is heavily romanticized by gamers who no doubt spent countless hours playing it in dorm rooms or fraternity houses (which might or might not have ended in tossed controllers and/or fisticuffs). 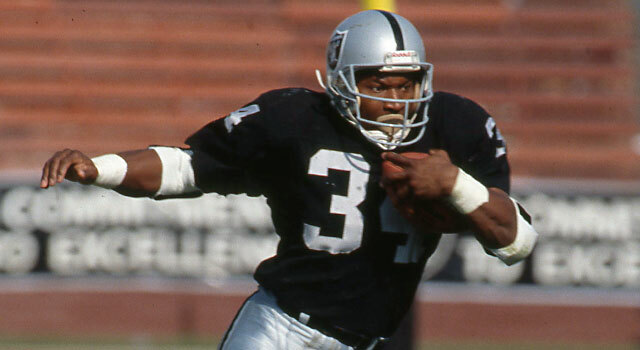 Drop the phrase "Tecmo Bowl Bo Jackson" into any conversation with sports fans, and you'll understand the true legacy of this game. Or just go ahead and check out this video. Hit up Rank with your list of best sports video games via Twitter or via Facebook Also be sure to catch the latest on the Dave Dameshek Football Program. Photo credits: Excitebike and Mike Tyson's Punch-Out courtesy Nintendo; Baseball Stars courtesy SNK; Super Tecmo Bowl courtesy Tecmo; NHL '94 and Madden courtesy EA Sports.